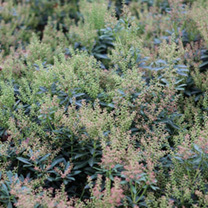 A small, compact evergreen shrub, Pieris Little Heath is perfect for planting in pots on the patio or in a border. The leathery dark green leaves are edged with with cream and flushed pink when young providing interest all year round. In spring bell-shaped creamy-white flowers form in panicles at the end of the branches. Height 100-150cm. Supplied in a 7.5-10 litre pot. A small, compact evergreen shrub, Pieris Little Heath is perfect for planting in pots on the patio or in a border. The leathery dark green leaves are edged with with cream and flushed pink when young providing interest all year round. In spring bell-shaped creamy-white flowers form in panicles at the end of the branches. Height 100-150cm. Supplied in a 3 litre pot or 7.5-10 litre pot.